On April 10, 2019 Veeam had the pleasure of joining GestaltIT in Santa Clara, California and presenting at Cloud Field Day 5. It has been a few years since Veeam last presented at a Tech Field Day event, so it was enjoyable and exciting for us to be back as a company. Veeam brought along three key members of the Product Strategy team in: Anthony Spiteri, David Hill and Michael Cade. Showcasing a number of product capabilities and providing the delegates with in-depth answers to their burning questions around Cloud technologies, Veeam demonstrated the innovation and power of Veeam Backup & Replication, Veeam Cloud Mobility and Veeam Availability for AWS amongst other capabilities. The event started with David Hill introducing Veeam, showcasing the success over the past ten years, and how Veeam is striving to become the $1 billion business that provides customers with simple, reliable and flexible solutions. Next up was Michael Cade to talk about Veeam’s Portable Data Format and Cloud Mobility. In a flashback to the 90s, Michael compared Veeam’s portable data format to a Zip Drive, describing how even in today’s modern world you can still open a zip file on any device, regardless of what platform you are using. This is the true power of a Veeam VBK. Anthony was up next to talk about Veeam Cloud Tier. As Anthony explained in his presentation, this is one of the most innovate capabilities from Veeam. Starting with a glossary on Veeam Cloud Tier, the presentation went through how you can use Veeam Cloud Tier as infinite capacity for your backup repositories, leveraging the power and scalability of Object Storage platforms and how you can shift your data from expensive on-premises storage to cheaper storage in the public cloud. Anthony dove in deep in this presentation, showcasing the block level migrations. Next it was back to David Hill for a look into Veeam Availability for AWS and, how leveraging Veeam N2WS Backup and Recovery, you can manage all your backups whether on-premises or out in the public cloud. With the integration of Veeam Backup & Replication and Veeam N2WS Backup and Recovery, Veeam provides a true multi-platform to restore any workload across any platform solution. 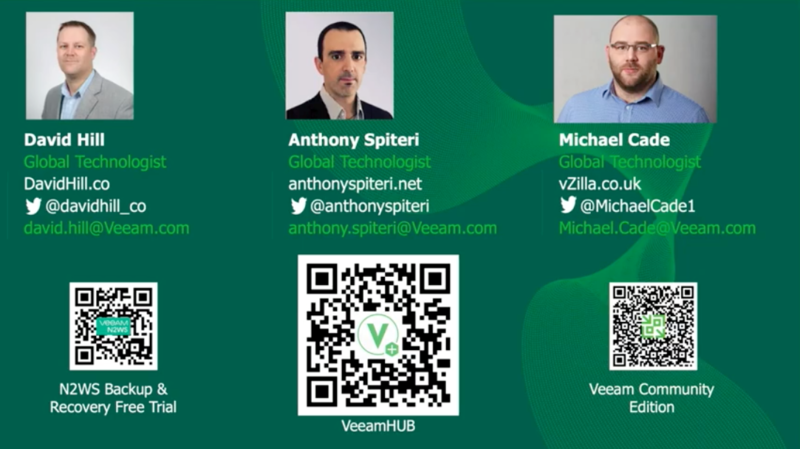 Finally, Anthony Spiteri talked about how Veeam provides key capabilities to Veeam Service Providers, talking about Veeam Cloud Connect and how Veeam integrate with VMware vCloud Director. Anthony started this presentation with a unique look at a reverse roadmap of Veeam industry-leading technology and features. Anthony also provided insight into his first experience of vMotion. Something we all never forget. Anthony then finished the presentation talking about VeeamHUB, which is an open source community where Veeam contribute lots of examples of how you can you use automation and orchestration. We hope you enjoyed this presentation, but let us know your thoughts down in the comment section.